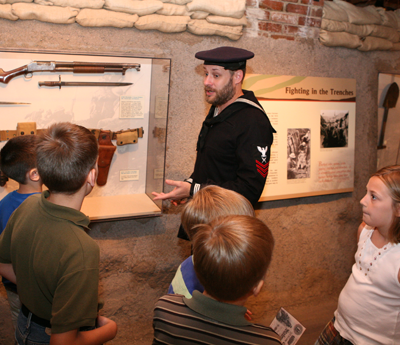 The South Carolina Confederate Relic Room and Military Museum offers a variety of education programs that provide basic curriculum reinforcement as well opportunities for enrichment. We operate with the conviction that familiarity with military history is vitally important to good citizenship, as well as being a high-interest area that draws students into history in general. History lessons become most meaningful when made “human” through relating the experiences and differing perspectives of actual people. Using dramatic artifacts, primary sources, and true stories of historical characters to whom students can relate, we strive to appeal to all grade levels and learning styles. Military history here is not just the story of men on the battlefield, but of the overall experience of war, including homefront hardships, economic concerns, and the role of technology. Bring your students to the South Carolina Confederate Relic Room and Military Museum to broaden their historical perspective and spark their enthusiasm. We hope to see you soon! The museum offers free lesson plans, activities sheets, and tour interactives for a variety of grade levels. These may be printed and used in the classroom and/or while visiting the museum. Cavalry History Hunt Worksheet and Answer List - This is an activity to be completed during a visit to the museum. It emphasizes “horse soldiers” throughout a variety of wars covered in the main gallery exhibits. Scavenger Hunt, Main Gallery Exhibits - This activity takes students on a complete tour of the museum's main gallery exhibits, complete with questions for each section. History Hunt, Main Gallery Exhibits and Answer List - Student should be able to locate most of the artifacts and answer the questions on this list during a tour. Revolutionary War Naval Simulation - This lesson will demonstrate to students the ways in which the Continental Navy, American privateers, and merchant sailors contributed to the winning of the American Revolution. Civil War Letter Writing Activity - This activity is designed for classroom use after your visit to the museum. The activity requires an envelope pattern – contact Joe Long to obtain this item. Mexican War Literary Activity - This activity encourages students to think about the literary devices employed in the poem and to find modern themes in historic war materials. World War I Exhibit and All Quiet on the Western Front English Lesson Plan - This lesson plan is designed to be used in conjunction with the novel by Erich Remarque. The following material can be used to supplement this activity: WWI Images. World War I: African-American 371st Infantry Regiment Lesson Plan - This lesson plan highlights the achievements of the 371st Regiment. It requires the following supplemental materials: 371st Handout, Graphic Organizer, and Venn Diagram. The SC Confederate Relic Room and Military Museum's educational programs received two awards from the South Carolina Council for the Social Studies. Joe Long, Curator of Education, was presented the annual Social Studies Program of Excellence and the Friends of Social Studies awards at the 2008 Social Studies Conference awards ceremony. Below are just a few reviews that Joe Long and the education programs at the SC Confederate Relic Room and Military Museum have received. Take a moment to read these and see why a visit to the state's military history museum is a necessary field trip. “Very well aligned with South Carolina standards.” - Elementary school teacher, Rock Hill, S.C.
“It was wonderful to let the students see and read about so many things we learned about in social studies – it linked very well to the S.C. Standards. The tour guide was very well informed and kept the students’ attention. The students were very excited and they LOVED it.” - Elementary school teacher, Landrum, S.C.
“Excellent review of the state’s history. Mr. Long was outstanding.” - Military school teacher, Summerville, S.C.
“We really enjoyed our visit. The lecture and exhibits are awesome. Our guide was dressed in Civil War attire and demonstrated great patience with my special education students. I am going to let everyone know how wonderful this trip was.” - Middle school teacher, Lexington, S.C.
“Our kids especially loved the weapons and ammunition from the various wars and eras. Thank you for allowing us to share in this wonderful museum.” - Elementary school teacher, Abbeville, S.C.
“An excellent presentation. The students were totally attentive due to the content and the style of the presenter. This exhibit is a must for any class which studies World War I.” - Elementary school teacher, Gilbert, S.C.
“The tour was very impressive and extremely beneficial. I am delighted that cadets had an opportunity to see, hear and gather so much information regarding the state…we look forward to the next visit.” - JROTC instructor, Cross, S.C.
“A wonderful museum. Students can learn so much here!” - Elementary school teacher, Spartanburg, S.C.
“Mr. Long’s tour kept the children’s attention through interesting stories and little known facts. Learning about history through the lives of real people from the past was especially effective.” - Elementary school teacher, Lugoff, S.C.
“Joe Long’s knowledge is almost miraculous. Thank you so much for the information, stories and the friendly atmosphere. We will definitely be back.” - Home school group leader, Grovetown, Ga.
“Very enjoyable and informative. The presenters kept the students engaged the entire time. The students were very eager to share the information that they learned with each other and their teachers. The students also enjoyed viewing all of the artifacts that reflect the history of their home state.” - Elementary school teacher, Columbia, S.C.
“Our kids were asking all sorts of questions – keep up the great work!” - Private school teacher, Greenville, S.C.
“The wealth of knowledge Mr. Long possesses and shares is amazing! He answered all questions. We enjoyed the way he explained the continuity of history, tying the Civil War to World War I and World War II.” - Home school parent, Columbia, S.C.
“It is a beautiful museum. I hope to have more time next time. 30 minutes is not enough.” - Private school teacher, Greenville, S.C.